Councilman King reveals tie between lack of enforcement and security, showing attack was next to public use plot usurped by Arabs. Jerusalem Councilman Arieh King made a shocking revelation on Thursday night, just hours after the funeral of Shalom Yohai Sherki, who police have begun to recognize was murdered in a car terror attack by an Arab driver in Jerusalem's French Hill neighborhood the night before. 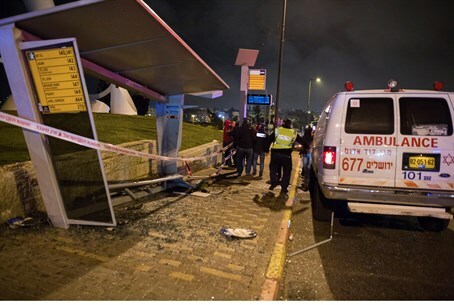 In the attack Sherki, the 25-year-old son of noted religious Zionist Rabbi Uri Sherki, and his date Shira Klein were run over as they waited at a bus stop, with Sherki murdered by the attack and Klein being critically wounded. King posted an explosive video on Facebook, illustrating his argument that due to the lack of law enforcement along Highway 1, also known as Chaim Bar-Lev Street, which is where the attack occurred, along with the "seizure by Muslim sources of lands meant for public use, the region of Highway 1 has become a central target for terrorists seeking to attack Jews in the very heart of Jerusalem." King identified the illegally seized plot on an aerial satellite map image as lot 32 in bloc 30509 as per urban planning scheme 1541A, 4229. He called on Prime Minister Binyamin Netanyahu and Jerusalem Mayor Nir Barkat to return the law enforcement and "sanity" to eastern Jerusalem, arguing that a strict enforcement of building and planning laws, as well as business and environmental laws, will create public order that will increase the "personal security for each of us." "The Jerusalem municipality is having trouble finding the way to return the plot to public use," King remarked wryly, noting "I wonder what would have happened if only today the plot had Jews in it." The councilman expressed his hope "that the attack yesterday will shock the decision makers: the prime minister and the mayor, and that in light of the connection between a lack of enforcement on Highway 1 and a lack of security through Highway 1, Bibi (Netanyahu) and Barkat will decide to return the sovereignty and security to Highway 1 in particular, and Jerusalem in general."